Optical wave propagation through the atmosphere is complicated by organized atmospheric structures, spanning a wide range of length and time scales, which induce spatio-temporal variability in refraction. Therefore, when considering long-range optical ray trajectories, the influence of such structures on the propagation path becomes significantly more complex compared to a hypothetically homogeneous atmosphere. 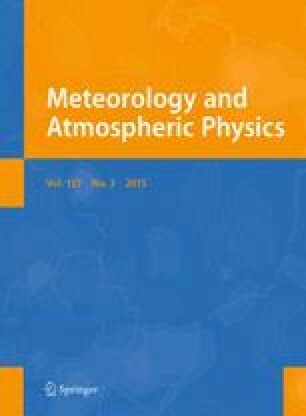 In this paper, we use a coupled mesoscale model and ray tracing framework to analyze the refractive anomalies associated with the wake vortices induced by three geographically diverse islands under various meteorological conditions. We identify organized mesoscale wake vortices (e.g., von Kármán vortices) which are sometimes capable of distorting optical ray trajectories, through ray bending, tens of meters at a range of approximately 50 km. In addition, we find in some cases that vertical oscillations, or perturbations, to the simulated ray trajectories share a frequency with the vortex shedding frequency on the order of hours. At the same time, it is also observed that the intensity and predictability of the wake vortex-induced ray bending varies from case to case. Collectively, these results highlight the value of using mesoscale models in optical wave propagation studies above conventional approaches which do not explicitly consider horizontally heterogeneous atmospheres. The authors acknowledge financial support received from the Department of Defense AFOSR under award number (FA9550-12-1-0449) in addition to financial and computational support received from the Renaissance Computing Institute. Any opinions, findings and conclusions or recommendations expressed in this material are those of the authors and do not necessarily reflect the views of the Department of Defense. It is important to acknowledge the potential sensitivity of the mesoscale modeling results presented in this study to specific model configuration. In this context, specific model configuration includes components such as spatial resolution, physical parameterization schemes, and grid discretization method. Given this, we studied one possible element of sensitivity to emphasize the uncertainty of the aforementioned results. Here, we performed an additional mesoscale model simulation of the Madeira case, with subsequent ray tracing through the wake region, but with double the original vertical resolution of 51 vertical grid levels. The results of the high vertical resolution (i.e., 101 vertical grid levels) run are shown in Fig. 14. As can be seen from the vertical cross-section plot, the qualitative features of the RIVG anomalies embedded within the von Kármán vortices are very similar to those produced by the coarser resolution simulation (i.e., Fig. 6). However, the layers of high vertical refractivity gradient appear noticeably sharper and more intense as would be expected with higher vertical resolution. In conjunction, ray tracing results indicate that the general oscillatory nature of ray height perturbations 50 km downstream from the origin is also present in the high-resolution simulation (Fig. 14, lower left panel). Furthermore, the relative period of the height perturbation oscillation is essentially the same between the high-resolution simulation (Fig. 14, lower right panel) and its original counterpart (Fig. 11, left panel). However, there are quantitative differences between the coarse-resolution and high-resolution ray tracing results. That is, primarily the high vertical resolution simulation had a greater range of height perturbation fluctuation during the 24 simulation hours of interest. Undoubtedly, this is due to the stronger vertical gradients of refractivity captured by the higher vertical resolution. With this in mind, we speculate that specific selection of mesoscale model configuration can potentially be a source of uncertainty when performing ray tracing based on mesoscale model output.